This is a course specifically designed for those who wish to learn or improve inland waterway boating skills. 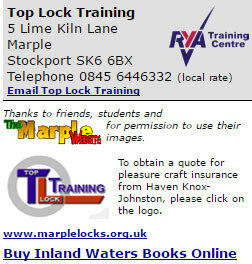 For those students who start with some experience the one-day course provides plenty of opportunity to improve ‘seamanship’, These notes are compiled specifically for inland waterways, and are issued to every student providing a permanent reference for future boating activities; The day starts at 0900hrs; tuition and assessment should be completed by 1730hrs. In fact on our day it was rain that was the problem; Lifejackets are the next decision. At Top Lock they insist you wear them when working round locks, as they point out that the water in a filling lock is full of air-bubbles, which makes it less dense, and even less likely to support your weight. Since we had brought our own, we opted to wear them all the time. With wet decks, and a long, cold day in prospect, this seemed a sensible precaution. At Canal Boat we use the automatic inflatable variety, as they are unobtrusive do not hamper your movements, yet will give full protection should you fall in, even if you knock your head and are unconscious. So the first of the pre-trip checks was to make sure the lifejacket is not damaged, and the gas canister is primed for use. Malcolm then went through the rest of the safety checks. He suggested that if you have a mobile phone that you keep it somewhere on the boat and not on your person, as if you fall in it is not much use any more. He also advised against walking along the side of the boat, pointing out that it is safer to walk though the boat at all times, and that you should avoid fending the boat off with your hands or feet. He then handed us a piece of paper, with four basic principles of narrowboat handling.